On this page you'll find free downloads that shift awareness to how we create suffering, as well as support for how to make a different choice and live in peace instead! To download them to your computer, just click the "download" links below to view the pdf. Then, when it opens, at the top of the page, click the arrow pointing downward. The sun doesn’t have to learn to shine and neither do you. Just uncover the You that ALREADY shines! Suffering is a case of mistaken identity. We think we are our concept of ourselves, which includes our body, mind, thoughts, emotions, actions and history. This isn’t what you are. You are the Awareness that is aware of all that. And it is this Awareness that ALREADY shines. How can I get from pain to peace? If we already ARE peace like you are saying, why isn’t everyone happy? Does suffering have a purpose? What do I need to do to be at peace? Why must I practice techniques like these if I already am peace? How can I get rid of uncomfortable feelings? Will my life be easy now, after practicing these techniques? 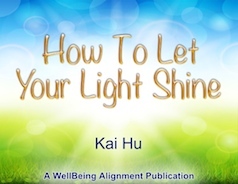 How To Let Your Light Shine also includes 4 simple, easy exercises to help you in shifting your allegiance from suffering to peace. We’re not in the world. The world is in us. Our creation and experience of the world is based entirely on our choices. Everything we experience is a result of our choosing it, whether consciously or unconsciously. Although it appears we have many choices, the underlying choice we always face is whether to choose the ego part of our mind that is based on separation, suffering and illusion, or the part of our being that is One with our Creator. Oneness is our True Reality, which we can access simply by shifting attention to it. All the other levels of our mind – beliefs, thoughts, emotions, and our physical experience – are the levels of effect. These levels display the results of our choices. To change our lives from suffering to peace, we must choose to give our allegiance to the truth of our being: Pure Awareness, where we are ALREADY at peace. 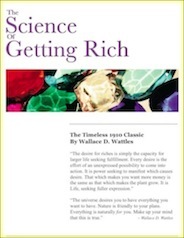 This an edited reprint of the timeless 1910 classic by Wallace D. Wattles (formerly titled Financial Success Through Creative Thought), which is now in the public domain. When I first heard of this book, I thought it was just another “get-rich book.” But the fact that it was written in 1910 intrigued me so I began reading it. I was amazed at what I experienced. Wallace Wattles speaks from a deep understanding of how ALL things are created on this plane. He shows us that everything we experience comes from our own choices, beliefs, and thoughts. Everything. This book is a powerful key to unlocking false beliefs many of us have suffered from. With Wallace Wattles’ help you will clearly understand a very important fact: You are not now, nor have you ever been, a victim of anything except your own choices. Once you understand and accept this fact you are in a position to completely change your life.